The selection of Joe Biden as Barack Obama’s running mate changes the whole dynamic of the Veep choice now facing John McCain. Sure, Biden brings credibility and experience and reassuring familiarity to the Democratic ticket, but he hardly adds sizzle or novelty. The Democrats feel that they’ve got enough pizzaz with their standard bearer, so it doesn’t hurt that they take a Vice Presidential contender with all the excitement of boiled Brussels sprouts. I hope that this choice now gives John McCain reason to reconsider the safe, reassuring possibilities of Mitt Romney or Tim Pawlenty—apparently, the two leading contenders for the running mate slot for the GOP. Both Romney and Pawlenty are fine men, with special appeal in swing states (Michigan and Minnesota, respectively), but neither candidate would contribute an explosive infusion of energy or electricity. In the same way that the Dems assumed they got enough novelty and excitement from the top of the ticket so they could go with experience and gravitas for the second spot, so the Republicans should recognize that they’ve got plenty of experience and gravitas with McCain so with his running mate they can go with a “breath of fresh air” candidate—someone new, unexpected, thrilling in some way, in order to shake up the electoral dynamic and undermine the big bounce Obama expects from Denver. I would suggest – strongly – that the campaign reconsider the Senior Senator from Texas, the Honorable Kay Bailey Hutchison. Okay, she’s not a dynamo of fiery charisma; in fact, as I’ve noted before, she’s a bland and sometimes boring speaker, and a pleasant if unprepossessing television presence. 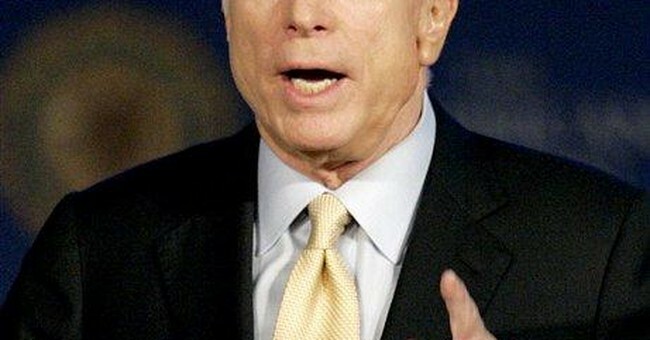 Nevertheless, she is a she--- and that fact in itself would allow McCain’s choice to upstage Obama’s. Current polls show that only half of Hillary’s voters currently back The One; a full 20% already support McCain. The remaining 30% of one-time Clinton true believers are undecided or thinking of staying home, and the idea of a first female in national office would, no doubt, appeal to some of them—perhaps even many of them. Most importantly, in contrast to Obama’s choice – which looks safe, cautious, timid and boring –the selection of a female candidate as Vice President would seem bold, daring, audacious….at the very time that “Hope” looks less audacious than tired. If Johnny Mac took a woman as his running mate, the lesson would be that the Old Guy still possessed his maverick instincts and the ability to shock the world and defy expectations. The press and the commentariat would love the story, and coming out of the dueling conventions of the next two weeks that’s no small matter. Meanwhile, Senator Hutchison herself – despite her limitations as an orator – is a formidable public servant with the elements of a great tale to tell. Most importantly, her conservative credentials are solid – and far more consistent than either Romney’s or Pawlenty’s. The American Conservative Union gives her a lifetime rating of 90.27, and a 2007 rating of 88—placing her among the more conservative Republicans in the Senate. On abortion, she’s always called herself “Pro Life” and NARAL Pro-Choice America—the leading pro-abortion lobbying group – has given her ratings of mostly 0% (like McCain) and never higher than 20%. She’s a former cheerleader for the University of Texas Longhorns (no mean distinction in a state famous for its beautiful cheerleaders) and went on to get her law degree from U of T. She worked for a while as a legal correspondent for a top Houston TV station before winning election to the legislature in 1972. During a break from politics, she became a bank executive and won conspicuous success as a business woman – the kind of private sector experience that Obama, Biden and McCain all lack. Her executive and administrative expertise includes an acclaimed term as Texas State Treasurer before her election to the Senate. Her drawbacks and weaknesses? It’s true that she suffered a 1993 indictment for allegedly illegal use of state resources in one of her campaigns, but the charges came from the infamous partisan prosecutor Ronnie Earle and were subsequently dropped with no conviction or admission of guilt or wrong-doing. More recently, her adoption of two small children in 2001 makes a great (and unusual) human interest story – and would help call attention to John and Cindy McCain’s own adoption of a physically challenged baby girl at the direct behest of Mother Theresa. (now the McCains’ beloved teenaged daughter Bridget). In any event, following a youthful divorce, Senator Hutchison has been happily married for thirty years to a former Republican legislator and gubernatorial candidate. Senator Hutchison has also written a couple of books – about women in the Senate, and largely unknown but deeply influential heroines of history. These aren’t literary masterpieces by any means (I tried to read one of ‘em to interview the Senator about it on my radio show) but they’re capably put together, and highlight her ability to inspire young women and girls to great achievements. When it comes to debating Joe Biden, she should do very well – and draw big ratings for only the second candidate’s debate in national history (after Geraldine Ferraro vs. George H.W. Bush in 1984) featuring a female contender. Senator Hutchison’s friendly understated style will provide a winning alternative to Biden’s logorrhea. In any event, the ho-hum Democratic choice gives McCain the chance to steal some excitement away from the Obama ticket, and the easiest way to accomplish that purpose would be the unexpected selection of a ground-breaking candidate --- either a woman (Senator Hutchison is the one viable female choice) or a person of color (Bobby Jindal of Louisiana is by far the best choice there). The Obama-Biden combination gives McCain and opportunity to do what he loves to do most in politics – confound expectations, shake things up, and stun the world. He can do so at the same time that he reassures and rallies his all-important conservative base. Kay Bailey Hutchison may not count as the most exciting individual in American politics, but her selection in the current campaign context could be electrifying. A McCain-Hutchison team might sore into the lead right after the euphoric surrounding the Republican convention, and could fight effectively to hold that lead (and to maintain the euphoria) all the way to November.